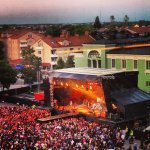 Def Leppard played a show at Vaksala Square in Uppsala, Sweden last night and setlist details are available. The band played a 14 song set once more in a show that took place in the centre of a very picturesque town square. 8 songs were played from the 'Hysteria' album with 'Gods Of War' returning to the set having been left out the night before due to the late start. The rest of the set remained unchanged. The strict local curfew of 11pm might account for the shorter than usual set length. The next show takes place on 6th July in Skanevik, Norway (or technically the 7th as it starts at midnight!). Starting the show for only the second time since 2005. Returning to the set for the first time since the Santiago de Compostela show.